Shelf United threw down the gauntlet to Sowerby Bridge in the Halifax AFL title race by running out emphatic 3-0 winners over their rivals at Lightcliffe Academy on Saturday. A Ben Grech double, with a goal from Oliver Coates in between, ended Bridge’s 12-game unbeaten run in the Premier Division this season. Leaders Bridge have a four-point lead over United, who have played two games fewer but were 3-1 down to Hebden Royd Red Star recently when that game was abandoned. League bosses will consider what action to take over that game on Tuesday evening. Bridge struggled to cope with the 3G pitch and home keeper Ethan Daly only had one good save to make, from an Adam Barlow header in the second half. After a scrappy opening Shelf started to assume control and struck twice in 10 minutes after the mid-point of the half. Grech scored with a header from a corner and Coates pounced on a loose ball and rounded a defender before extending the lead. A Bridge fight back failed to materialise in the third quarter and United created some good chances in the last 20 minutes. Billy Grogan set up Grech for the clincher with five minutes left and Grogan also hit the bar with a speculative long-range volley. Shelf FC stayed in the hunt for successive titles with a 4-0 win away to bottom side Calder ‘76. A depleted Calder side battled bravely. They held out for 40 minutes and were only 1-0 down approaching the hour mark but Shelf’s second goal deflated them and the visitors ran out comfortable winners. Josh and Matthew Hartley, substitute Bradley Osbourne and Callum Lewis were Shelf’s scorers at Luddenden Foot. Leading scorer Lewis was making it 24 for the season. Hebden Royd Red Star continued their much-improved form this season with a 5-1 success away to third-from-bottom Denholme United. Toby Priestley scored the Foster Park side’s consolation goal. Salem left it until the final Division One match of the season to bag a first win, beating visitors Elland Allstars 4-2 in a basement battle at Shroggs Park. It was a personal triumph for Jay Thomas who scored all the home side’s goals. Stefan Drakes and Jorge Westin-Pearson replied for Allstars, who have also only one win to their name but five points compared to Salem’s four. 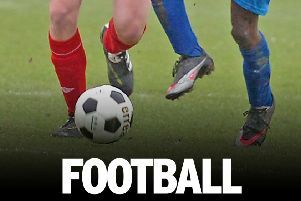 Illingworth St Mary’s Reserves went second in Division Two courtesy of a 3-0 home win over Sowerby Bridge Reserves and need to avoid defeat away to rivals Shelf United Reserves in the pair’s final game on Saturday to beat United to the runners-up berth. Midgley United Reserves’ hopes of finishing second were dashed by visitors Crossleys, who won 7-1 in spite of already having clinched the title. Bailey Naylor did much of the damage at Midgley Rec, scoring five of Crossleys’ goals. He now has 40 goals from 19 games this season. Only two games took place in the bottom section with Hebden Royd Red Star unable to raise a team to send to play table-toppers Elland United. Shelf FC Reserves look set to finish runners-up. They had six different scorers in a 7-1 home win over Warley Rangers with James Grace the player to net twice. AFC Crossleys Reserves’ Toby Bates and Flying Dutchman’s Daniel Murgatroyd each scored twice at Holmfield Rec but it was the visitors who emerged victors, by 5-3, to jump up a couple of places to third.